Angiogram and Heart Cath | Memorial City Cardiology Assoc. Vascular ultrasound refers to the evaluation of blood vessels using ultrasound waves. The vessels most commonly imaged are in the neck, legs, and arms. Your ordering physician will determine based on your symptoms which vessels specifically, arteries or veins, need to be imaged. 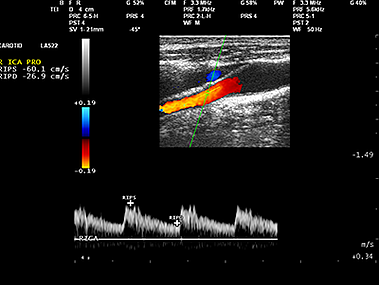 Vascular ultrasound tests performed in our office are carotid, arterial, or venous study. A Carotid Doppler is the ultrasound of the arteries that lead from your heart to your brain. The arteries are located on the right and left side of your neck. The test is non-invasive and may take up to 30mins, though it’s usually shorter. It’s primarily ordered to assess plaque (fatty deposits), calcium, and degree of obstruction or impedance on blood flow. Among the many indications for ordering a carotid ultrasound is dizziness, syncope, history of stroke/TIA, or a bruit (abnormal sound heard from the neck using a stethoscope). It may also be ordered to follow up post a carotid endarterectomy , or assessing for presence or absence of aneurysm or lesions, as well as the progression of known carotid artery disease. We recommend wearing an open-neck shirt, otherwise no preparation is required for a carotid ultrasound. After the completion of the carotid ultrasound, it will go to a designated physician for interpretation. This is where the final result is generated. A member of our staff will contact you to inform you of your results. No risks have been demonstrated with ultrasound. An Arterial Doppler is an ultrasound study that focuses on arteries. An arterial Doppler may be ordered for upper and/or lower extremities. It provides detail about the structure of the vessel wall and utilizes color to assess blood flow within the vessel, often to rule out the presence or absence of an obstruction in the specified vessel. An Arterial Doppler may be ordered as a result of recent pain triggered by exercise, or leg pain occurring at rest. It may also be ordered because of decreased palpable pulses or to check the status on a bypass graft. There are other indications for having an arterial Doppler which your ordering physician can discuss with you in further detail. Some of the findings available through ultrasound are arthersclerosis, arteriovenous fistulas, pseudoaneurysm, and dissections. An Arterial Doppler is more commonly ordered on lower extremities (legs). It is a non-invasive test that usually takes approximately 45mins to complete. In order to image your legs, socks and pants will need to be removed so please plan and dress accordingly. A measurement called Ankle-brachial index is obtained as part of an Arterial study. For this portion of the test blood-pressure cuffs will be used to record systolic pressures from both your ankles and both your arms. The sonographer will then begin the ultrasound portion of the test by applying the transducer with gel to your inguinal ligament, near the groin area, and follow the artery down to the ankle. After the completion of the Arterial Doppler ultrasound, it will go to a designated physician for interpretation. This is where the final result is generated. A member of our staff will contact you to inform you of your results. To date, no risks have been demonstrated with ultrasound. A Venous Doppler is an ultrasound that focuses on veins. A venous Doppler may be ordered for upper and/or lower extremities. It provides detail about the structure of the vessel wall and assesses blood flow within the vessel. Ruling out the presence or absence of a DVT (deep vein thrombosis), also called blood clot, in the specified vessel is one of the most common indications for a venous Doppler. A DVT may manifest itself by sudden pain, discoloration, or a change in temperature of the skin. It may due to trauma to a limb or caused the condition called Atrial Fibrillation. A venous Doppler may also be ordered for evaluation of venous insuffiency or long standing swelling. A venous Doppler is a non-invasive test that usually takes approximately 45mins to complete. In order to image your legs, socks and pants will need to be removed so please plan and dress accordingly. The sonographer will begin the ultrasound portion of the test by applying the transducer with gel to your inguinal ligament, near the groin area, and follow the vein down to the ankle. With the transducer, the sonographer will press down on specific areas along your leg. Also expect the sonographer to lightly squeeze your calf, and or your foot, at various times throughout the test. This is a normal step necessary for the completion of a venous ultrasound study. After the completion of the Venous Doppler ultrasound, it will go to a designated physician for interpretation. This is where the final result is generated. A member of our staff will contact you to inform you of your results. To date, no risks have been demonstrated with ultrasound. If your cardiologist has recommended a heart catheterization (or angiogram) at your last visit, he/she would like to better assess the condition of your coronary arteries. More specifically, he/she wants to determine if your heart is receiving a sufficient amount of blood. This outpatient procedure is a very useful and safe method of not only improving heart function that may decrease with time but also preventing a future heart attack that may come as a result of narrowed coronary arteries. Over time, the coronary arteries that are responsible for supplying the heart with oxygen rich blood can become narrowed due to plaque buildup. This build up comes from the foods we eat and can become worst with diets high in fat. When this plaque builds up on the side of the arteries, two things can happen. One, plaque will completely close off the circulation of blood flow to a specific region of the heart. The second, the plaque that formed on the artery walls will become loose and travel down the artery until it comes to a stop point within the heart muscle. In both cases, parts of the heart will have tissue that dies as a result of not receiving oxygenated blood. This is what is known as a heart attack (or myocardial infarction). A heart catheterization is performed by inserting a catheter through your groin and into the femoral artery. This artery branches off from the abdominal aorta and supplies blood to the lower limbs. By guiding this catheter up your aorta and into the coronary vessels of the heart, doctors can determine if there are any circulatory constrictions. During this procedure, if your cardiologist feels the need for coronary intervention, he or she will deploy a metal stent that will restore diminished blood flow. The stent works by increasing the vessel diameter which in turn allows more blood to circulate efficiently. The permanently affixed stent inside the vessel is completely painless for the patient and there are no precautionary measures that need to be taken on the patient’s part thereafter. Once you and your physician have agreed to go through with an angiogram, your cardiologist office will schedule this outpatient appointment for you based on your availability. There are no special instructions leading up to the day of your procedure. Medications, including blood thinners if prescribed, are to be taken as normally. Upon arrival at the hospital, you will be prepped and have a few minutes to go over expectations with your doctor and nursing staff. Your procedure should only take about 45 minutes with or without stent deployment. After your procedure has been completed, you should expect to stay in the hospital a few hours for observation. This is a just a precautionary measure taken to make sure that you are in stable health before releasing you back home. Once you have been released from the hospital, refrain from doing any kind of heavy lifting for a minimum of at least three days. This will prevent any injury to the groin entry site of the heart catheterization. A nuclear stress test is one of the best ways to diagnose heart disease. The basic technique requires injection of radioactive particles (called radionuclide) into the bloodstream. These particles circulate through the blood and are detected by a special camera. When your Cardiologist looks at the images like those below, he can see how well the heart "glows" while beating. If there are areas that do not light up as well as others, this maybe a sign of low blood flow or ischemia. A coronary angiogram is the only method available today to confirm if the ischemia is truly present, which is often necessary after an abnormal nuclear stress test result. At Memorial Katy Cardiology Associates, we continue to upgrade our facilities and improve our services to provide our patients with the best care available today. With this mindset, we have recently added Cardiac PET to our arsenal of tests. Cardiac PET provides us with images that are more clear than a standard SPECT (traditional nuclear stress test) so we can see even better how well your heart functions both at rest and under stress. 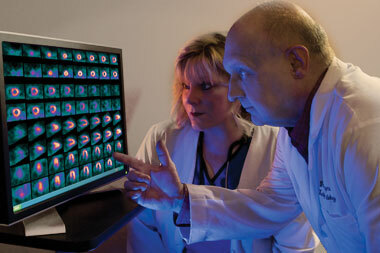 This allows us to better diagnose your heart disease so we can prescribe the absolute best treatment possible. The medication we use is also kept on site, so we no longer have issues of drug shortages, which were a significant problem in 2010 nationwide. This test is even more advantageous than a SPECT for larger patients (or patients with large breasts) because the PET camera can detect the radioactive particles better through thicker tissue. Start to finish, this test usually takes about 45 minutes to 1 hour, much shorter than a SPECT. We are the first office in Harris County outside of the Texas Medical Center to obtain a Cardiac PET camera. 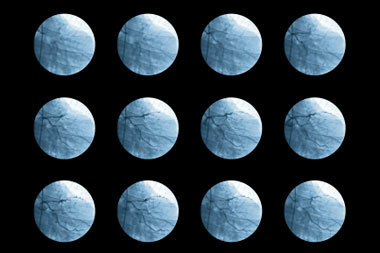 There are slighly more than 100 Cardiac PET cameras in the United States. Of the nation's top 10 ranked hospitals, all 10 have a Cardiac PET camera. Click here to see this list. Download the PET instructions document. 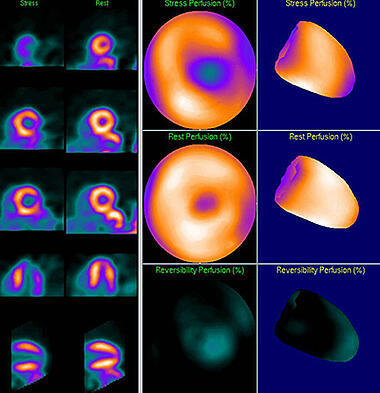 Cardiac SPECT has been the workhorse of Cardiology for decades. 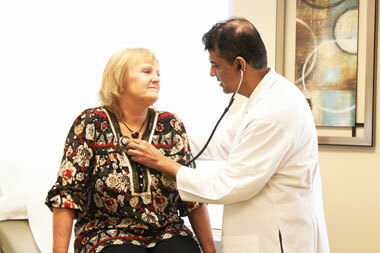 It is a very proven technology that is effective in diagnosing heart disease in many patients. There are shortfalls with this technology that have been improved upon over the years, however the relatively lower cost and substantial history behind this test have kept this technology at the front of many Cardiologists’ diagnostic regimen. The basic technology is similar to that of a PET scan, but the scanner itself looks different and the isotope used is different. The test will take 3 to 4 hours to complete because of the time it takes for the isotope to work and the resting period necessary between scans.